I was hoping to make an ATMEL ATMega32 development board for my own use. I though of adding capacitors, an oscillator and normal power and ground connection pins. 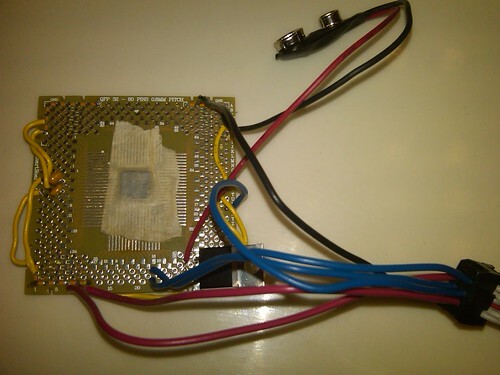 I saw a few images on the net which had a lot of other components on them, like LEDs, LCDs, Serial ports and different ICs. Can anyone please suggest me a few ideas on how to go about making a development board for my own projects? 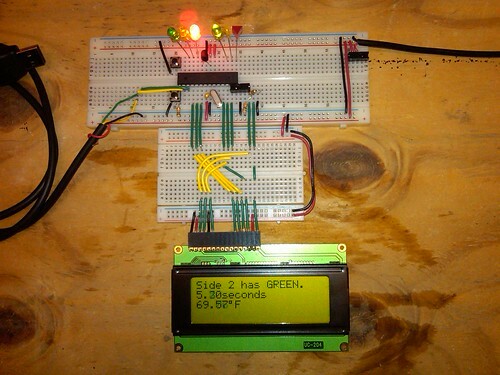 Are you wanting something different than a breadboard like is in the NerdKit? I recently put together a semi-permanent dev board using a SchmartBoard and a TQFP package ATMega168. I wired it up using the voltage regulator that came with the NerdKit and I bought a few capacitors. Other boards you've seen probably have an LED as a "pilot light" for the power supply, and the LCD is usually for debugging and other uses where a display is needed. Not sure what the "different" ICs are for but if I had to guess, I think some dev boards come with the USB to Serial converter chip onboard(FTDI) or they might have extra dataflash ram or even LED controller chips for controlling much more LEDs. So, it really depends on what you are wanting to do with it in the long run. For basic, everyday development, I personally just bought a larger breadboard for my NerdKit. The images are really nice and your breadboard setup seems so clean and non-messy. Guess I will use a breadboard after all like you did.